The open-source Android OS allows its users to change the built-in keyboard with many available keyboard apps, in accordance with the likes and functions the users need. Unlike other Operating Systems like iOS or Windows, that does not allow us to in a tall custom keyboard on the device. This makes the various applications developers keyboard competing to produce interesting features, such as gesture-typing that now has been owned by the Android keyboard officially, after previously successful in third-party keyboard applications. Installing third-party keyboards is easy, you can download them from Google Play and run the app, and will usually show instructions on how to enable the third-party keyboard. Here are 5 favorite third-party keyboards (5 Android Keyboard Alternative) which you may choose as needed. This is the official Android keyboard available on Google Play, this keyboard is usually the default keyboard on Google Nexus devices. 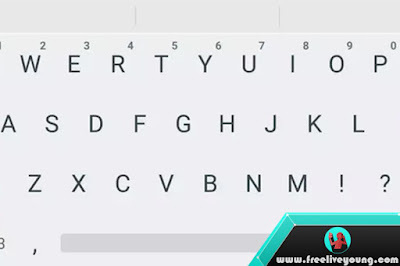 Because Android devices usually have a built-in keyboard from the manufacturer's brand, then you can install Google Keyboard to get some features such as gesture typing, prediction, and voice recognition. This keyboard is perfect for those of you who like simplicity. SwiftKey mentions its own app as a reader of the user's mind, since SwiftKey has its prediction engine, which is working better when you use it more often. Although this application is paid for around $ 5, you can still try the trial version for 1 month free. Although the price is expensive, but apparently many are interested in this keyboard. In addition to the word prediction feature, there is also an auto-correction feature so you can keep typing as fast as possible and SwiftKey will justify the wrong word automatically. Wow .. this feature is very easy of course! SwiftKey also this time has included gesture typing feature called SwiftKey Flow so you can type by sliding fingers on the keyboard only, without fear of wrong and more flexible. Swype is the longest application that designs gesture typing technology, which is then much in imitation by other keyboard applications. But this feature seems to be more developed and more accurate than its competitors. If your hobby is typed with the gesture-typing feature then Swype is the right choice. Swype also does not include free apps, we must buy this app for $ 1 USD, but you can still download a free trial version for 1 month. One of these popular keyboard apps presents a unique interface, full of options over the keyboard. From its keyboard interface, we can directly access the GO Market where you can install extensions like Emoji, new themes, and emoticons to be accessible in GO Keyboard directly. GO keyboard has its own engine for predictive text feature and also supports slide-typing. If you are creative you can download hundreds of themes you like then edit the theme back as needed. Minusnya if you add too many extensions/themes on the GO keyboard, then its performance is often a bit heavy, thus slowing the performance of your device. But this super customizable application you can download for free (some extensions/themes are paid). This third-party keyboard application is still in beta stage. This one keyboard is very unique and interesting, because of its different shape so we can feel the new experience of typing on the Android keyboard. Minuum unites 3 lines on a conventional keyboard into 1 line so you can get more space for the display on your device. With Minuum each letter is smaller and more difficult to access, but Minuum also includes a smart auto-correction feature that will fix your word writing errors, so you do not have to press the keys correctly. Unfortunately, auto correction is only available in English. Again the minus is that you have to buy this app for $ 4 USD, and no trial free version is available. The keyboard is one part of the Android OS that you can custom through the programs available on Google Play. Of course, there are still many third party interesting keyboard, please convey the Android keyboard recommendations we in the comment field below if you have other options.